The latest reviewed version was checked on 12 March 2019. There is 1 pending change awaiting review. Special variables provide an alternate means of passing arguments to modules and functions. All user, or OpenSCAD, defined variables starting with a '$' are special variables, similar to special variables in lisp. Modules and function see all outside variables in addition to those passed as arguments or defined internally. The value for a regular variable is assigned at compile time and is thus static for all calls. Special variables pass along their value from within the scope (see scope of variables) from which the module or function is called. This means that special variables can potentially have a different value each time a module or function is called. // ECHO: "         outside    ", "regular global", "   ", "special global"
// ECHO: "in regular loop     ", 0, "   ", "special global"
// ECHO: "         in show    ", "regular global", "   ", "special global"
// ECHO: "in regular loop     ", 1, "   ", "special global"
This is useful when multiple arguments need to be passed thru several layers of module calls. 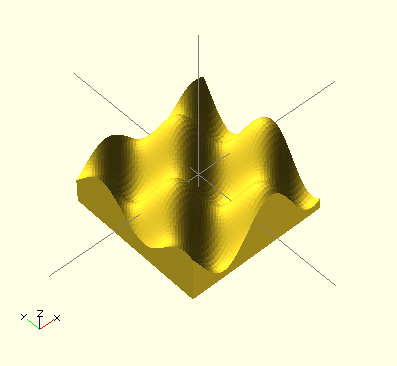 Several special variables are already defined by OpenSCAD. $fa is the minimum angle for a fragment. Even a huge circle does not have more fragments than 360 divided by this number. The default value is 12 (i.e. 30 fragments for a full circle). The minimum allowed value is 0.01. Any attempt to set a lower value will cause a warning. $fs is the minimum size of a fragment. Because of this variable very small circles have a smaller number of fragments than specified using $fa. The default value is 2. The minimum allowed value is 0.01. Any attempt to set a lower value will cause a warning. $fn is usually 0. When this variable has a value greater than zero, the other two variables are ignored and full circle is rendered using this number of fragments. The default value is 0. The higher the number of fragments, the more memory and CPU consumed, large values will bring many systems to their knees. Depending on the design, $fn values, and the corresponding results of $fa & $fs, should be kept small, at least until the design is finalised when it can be increased for the final result. A $fn over 100 is not recommended or only for specific circumstances, and below 50 would be advisable for performance. TIP: If you want to create a circle/cylinder/sphere which has a axis aligned integer bounding box (i.e. 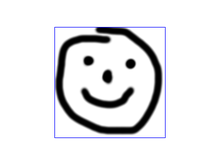 a bounding box that has integral dimensions, and an integral position) use a value of $fn that is divisible by 4. When $fa and $fs are used to determine the number of fragments for a circle, then OpenSCAD will never use fewer than 5 fragments. Spheres are first sliced into as many slices as the number of fragments being used to render a circle of the sphere's radius, and then every slice is rendered into as many fragments as are needed for the slice radius. You might have recognized already that the pole of a sphere is usually a pentagon. This is why. The number of fragments for a cylinder is determined using the greater of the two radii. The method is also used when rendering circles and arcs from DXF files. The variables have no effect when importing STL files. The $t variable is used for animation. If you enable the animation frame with view->animate and give a value for "FPS" and "Steps", the "Time" field shows the current value of $t. With this information in mind, you can animate your design. The design is recompiled every 1/"FPS" seconds with $t incremented by 1/"Steps" for "Steps" times, ending at either $t=1 or $t=1-1/steps. Which pattern it chooses appears to be an unpredictable, but consistent, function of Steps. For example, when Steps=4, it follows the first pattern, and outputs a total of 4 files. When Steps=3, it follows the second pattern, and also outputs 4 files. It will always output either Steps or Steps+1 files, though it may not be predictable which. When finished, it will wrap around and recreate each of the files, looping through and recreating them forever. These contain the current viewport rotation and translation and camera distance - at the time of doing the rendering. Moving the viewport does not update them. During an animation they are updated for each frame. You can also make bits of a complex model vanish as you change the view. which allows a simple 360 degree rotation around the Z axis in animation mode. The menu command Edit - Paste Viewport Rotation/Translation copies the current value of the viewport, but not the current $vpr or $vpt. [Note: Requires version nightly build] $preview is true, when in OpenCSG preview (F5). $preview is false, when in render (F6). Another use could be to make the preview show an assembly view and the render generate just the printed parts laid out for printing. If printed parts need extra features that are removed post printing, for example support for suspended holes, then the preview can omit these to show the finished part after post processing. 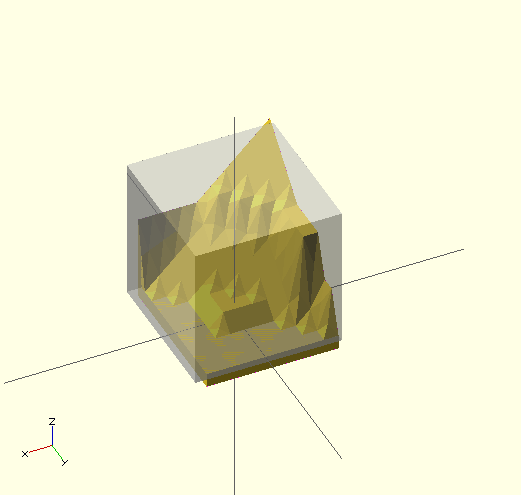 When OpenSCAD is run from the command line $preview is only true when generating a PNG image with OpenCSG. It is false when generating STL, DXF and SVG files with CGAL. It is also false when generating CSG and ECHO files. This may or may not be what you want, but you can always override it on the command line like any other variable with the -D option. 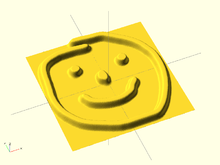 The OpenSCAD console supports a subset of HTML markup language. See Qt Docs for details. Note: the Output can be copy and pasted into OpenOffice, where both the image and the link work fine. Echo can be used in expression context to print information while the function/expression is evaluated. The output is generated before the expression evaluation to allow debugging of recursive functions. A more complex example shows how echo() can be used in both descending and ascending path of a recursive function. The result() helper function is a simple way to output the value of an expression after evaluation. Forces the generation of a mesh even in preview mode. Useful when the boolean operations become too slow to track. Surface reads Heightmap information from text or image files. The search() function is a general-purpose function to find one or more (or all) occurrences of a value or list of values in a vector, string or more complex list-of-list construct. Can be a single value or vector of values. Strings are treated as vectors-of-characters to iterate over; the search function does not search for substrings. Note: If match_value is a vector of strings, search will look for exact string matches. The string or vector to search for matches. If num_returns_per_match > 1, search returns a list of lists of up to num_returns_per_match index values for each element of match_value. If num_returns_per_match = 0, search returns a list of lists of all matching index values for each element of match_value. When string_or_vector is a vector-of-vectors, multidimensional table or more complex list-of-lists construct, the match_value may not be found in the first (index_col_num=0) column. See Example 5 below for a simple usage example. 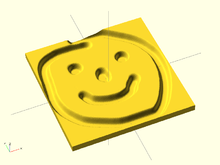 See example023.scad included with OpenSCAD for a renderable example. Example 6: Return all matches per search vector element. Example 7: Return first match per search vector element; special case return vector. Example 8: Return first two matches per search vector element; vector of vectors. ECHO: "Default list string search (["b", "zzz", "a", "c", "apple", "dog"]): [1, , 4, 2, 9, 3]"
version() and version_num() will return OpenSCAD version number. $parent_modules contains the number of modules in the instantiation stack. parent_module(i) returns the name of the module i levels above the current module in the instantiation stack. The stack is independent of where the modules are defined. It's where they're instantiated that counts. This can be used to e.g. build BOMs. top() middle() echo(parent_module(0)); // prints "middle"
top() middle() echo(parent_module(1)); // prints "top"
Assert evaluates a logical expression. If the expression evaluates to false, the generation of the preview/render is stopped with an error. A string representation of the expression and, if given, the message is output to the console. Expression. The expression to be evaluated as check for the assertion. String. Optional message to be output in case the assertion failed. The simplest example is a simple assert(false);, e.g. in a file named assert_example1.scad. This example has little use, but the simple assert(false); can be used in code sections that should be unreachable. When writing a library, it could be useful to output additional information to the user in case of an failed assertion. WARNING: Ignoring unknown variable 'a'. which off-course causes warning(s), but requires no changes to code relaying on is_undef(). This page was last edited on 16 March 2019, at 18:13.